The US has decided to impose sanctions on nine more individuals and 16 organisations in Iran involved, according to Washington, in terrorist activities and the Iranian nuclear programme, the Treasury Department said in a press release. 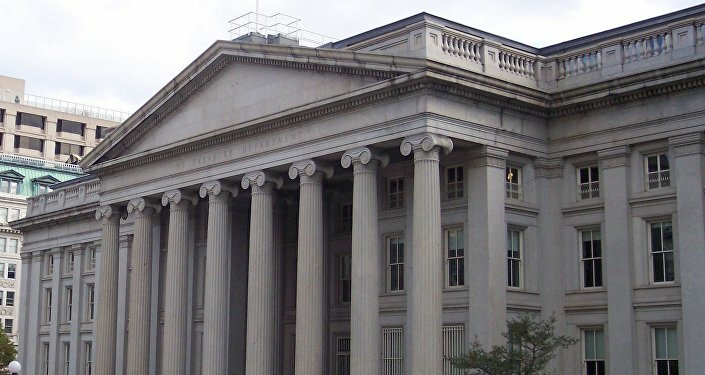 "The U.S. Department of the Treasury's Office of Foreign Assets Control (OFAC) took action against 25 individuals and entities, including a network of Iran, UAE, and Turkey-based front companies, that have transferred over a billion dollars and euros to the Islamic Revolutionary Guard Corps (IRGC) and Iran's Ministry of Defense and Armed Forces Logistics (MODAFL), in addition to procuring millions of dollars' worth of vehicles for MODAFL", the release said. "We are targeting a vast network of front companies and individuals located in Iran, Turkey, and the UAE to disrupt a scheme the Iranian regime has used to illicitly move more than a billion dollars in funds. The IRGC, MODAFL, and other malign actors in Iran continue to exploit the international financial system to evade sanctions, while the regime funds terrorism and other destabilizing activities across the region", Treasury Secretary Steven Mnuchin said, as quoted by the department. The Treasury Department explained that the IRGC-controlled Ansar Bank and the bank's currency exchange arm served as the hub for a regional network with layers of intermediary entities allowing devalued Iranian rials to be exchanged for dollars and euros. US sanctions against Tehran were reinstated last year after the United States withdrew from the Joint Comprehensive Plan of Action (JCPOA), which provided for the relief of economic sanctions against Tehran in return for Iran's pledge to keep its nuclear programme peaceful.